Question: I would like clarity on hydrotherapy. Am I supposed to take four glasses of water or one glass of water immediately after I wake up? How am I supposed to take the two liters of water? Nancy's Response: Our bodies can only utilize about 12 to 16 ounces of water at one time. So I drink 16 oz. of water when I first wake up. About 30 minutes later, I will drink another 12 to 16 ounces of water before breakfast if I can. So ideally I like to drink about 1 liter of water before breakfast. That really sets my day right for optimal hydration. If I do not have time to drink a full liter before breakfast, I will start drinking water again about one hour after breakfast. You want to wait at least 30 minutes after eating in order to give food time to digest without diluting digestive enzymes. Then I try to drink the rest of my water quota throughout the day up until dinner time. I generally just sip water or herbal tea after dinner so that I am not waking up during the night to go to the bathroom. So how much you drink each day really depends on your health condition, how well hydrated you are now, the type of water you drink (micro-clustered water is more hydrating than other types of water), and how much you weigh. You might want to read my article on Drinking Enough Water or Drinking Enough Water Facts to determine if 2 liters per day is enough for you. 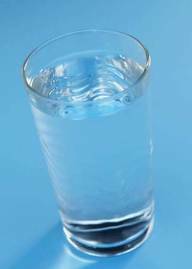 Drink about half your body weight in ounces of water each day. Drink no more than 12 to 16 ounces at a time. Drink one quart of water before breakfast if possible. Drink 8 to 16 ounces of water 30 to 60 minutes before meals for optimal nutrient utilization. Avoid drinking anything during meals or immediately following meals since fluids dilute the digestive juices. If you must drink fluids during meals, sipping water or warm tea is the best. Wait at least 30 minutes and preferably 60 minutes after a meal before drinking water again.